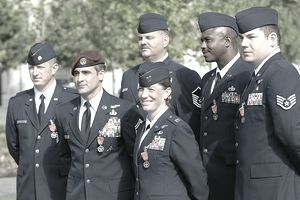 Like all branches of the U.S. military, the Air Force uses medals and ribbons to recognize airmen and women who have performed bravely both in combat and non-combat situations, as well as those wounded or killed in battle. Most of the Air Force medals have counterparts in the Army, Navy, and Marine Corps. Here are some of the best-known medals awarded by the Air Force, listed in no particular order. The highest honor for heroism, the Air Force Medal of Honor is a gold five-pointed star, one point down, inside a wreath of green laurel. Each point is tipped with trefoils and includes within the background a crown of laurel and oak. An annulet of 34 stars, representing the head of the Statue of Liberty, is centered on the star. The star is suspended from a bar and bears the inscription "VALOR" above a rendering of the USAF coat of arms thunderbolt. This is the Air Force version of the Army's Distinguished Service Cross, and the Navy and Marine Corps' Navy Cross. This is given for extraordinary heroism for an action against an enemy of the United States, or while serving in an armed conflict against an opposing armed force. It's awarded in situations where the actions don't quite justify the Medal of Honor. Awarded to general officers for "exceptionally meritorious service to the government," in combat or noncombat situations. The Silver Star is awarded for acts of heroism or valor over a short period, such as a battle that lasts more than a day. Air Force pilots may receive the Silver Star after five or more combat situation confirmed kills (also known as an ace), in situations where he or she has risked their life numerous times. Given for heroic or meritorious achievement or service in connection with military operations against an armed enemy, not involving aerial flight. All branches of the American military have a medal for servicemen and women wounded or killed in action. The Purple Heart has a profile of George Washington, who created the award, originally called the Badge of Military Merit. It was renamed the Purple Heart since the color purple symbolizes bravery and courage. Recognizes service in a position of great responsibility in a joint activity. This medal is usually awarded to senior officers such as generals and colonels (which makes sense given its description). Legion of Merit: Designed to be given to the citizens of other nations as well as American military personnel. Distinguished Flying Cross: Awarded for heroism or extraordinary achievement while in an aerial flight. Airman's Medal: Given for heroic acts not involving actual combat. Defense Meritorious Service Medal: Recognizes noncombat meritorious service in a joint assignment. Meritorious Service Medal: For outstanding noncombat meritorious achievement or service. Air Medal: For single acts of heroism or meritorious achievements in aerial flight. Good Conduct Medal: Given to soldiers who display exemplary conduct, efficiency and fidelity in active duty. National Defense Service Medal: For honorable active service during the Korean War, Vietnam War, Gulf War, or War on Terrorism, including Reserve members ordered to active duty.